Haha... oh man, I never pictured the ice caps would be like that. Like, I never thought those landmasses would be connected in the South... this changes things, and I'm excited! 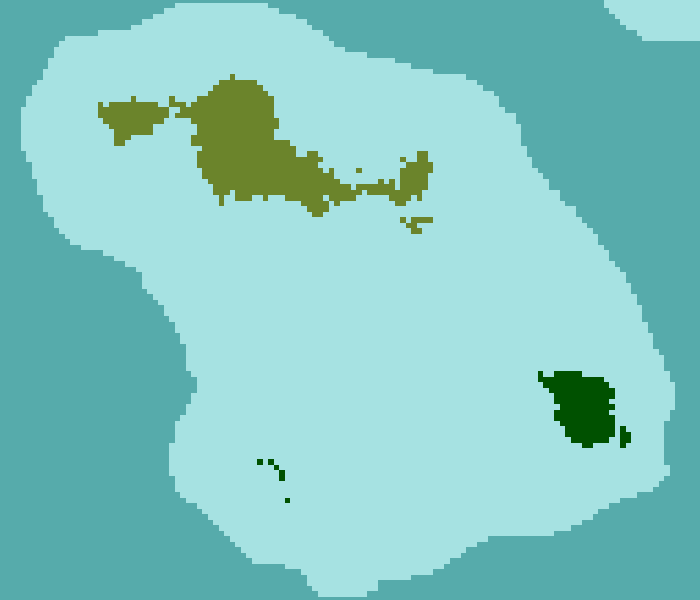 Also that tiny island on the right side of the map on the upper continent, we've somehow lost its biome data on the map. It has been done, we may just need to check layers. Can you point out which island you are referring to? Nevermind found it, fixing it. Edit: I've fixed it, but can we get some eyes going through and seeing if there are any other errors that need correcting before I reupload them again? Honestly I already did that... which was why I'm a little troubled that the island wasn't colored in. I spent hours combing through my versions of the maps to fix the pixels and stuff, and my copies seem to have everything marked. There may yet be a few missed spots though. Yeah, I'm honestly not sure how it happened. I haven't noticed any other spots yet, but the more eyes we have on it the better. I also added a blue line in the ice caps to represent the summer extents. First image is actual size, second is at 400% for clarity. 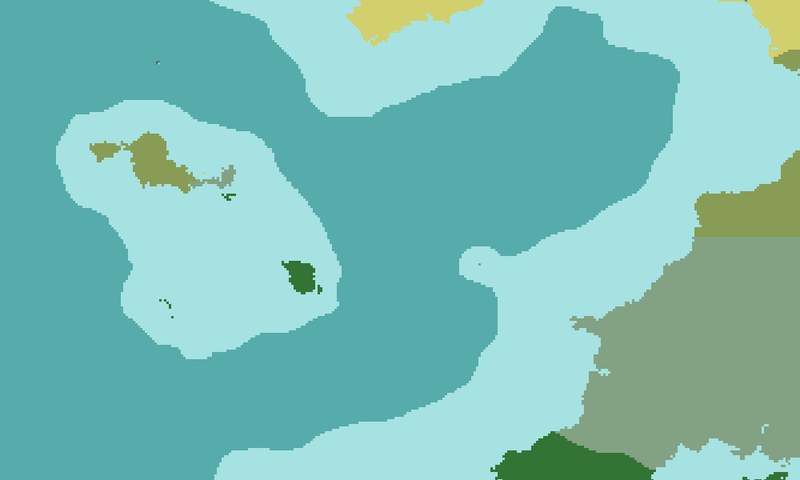 Last thing, this archipelago on the left has four separate biomes in it. Seemed rather odd, but I wanted to see what others though before I did anything with it, thoughts? For the archipelago, that yellow dot can definitely go. I don't mind a more densely forested jungle on the island to the south. The portion that is monsoon forest could either be changed to match the majority of that landmass, or we can just assume it's a mushy foresty area. Changing it to be uniform is probably the better choice. During research I found that Ascension Island is wetter than St. Helena, and they aren't terribly far apart (they are the ceneters for the top two circle in >this map<). As such I think would should count that island chain as "St. Helena and Ascension" as far as ecozone equivalency is concerned. Oh cool, glad there is an actual real-world precedent for it. Yeah that sounds good to me. 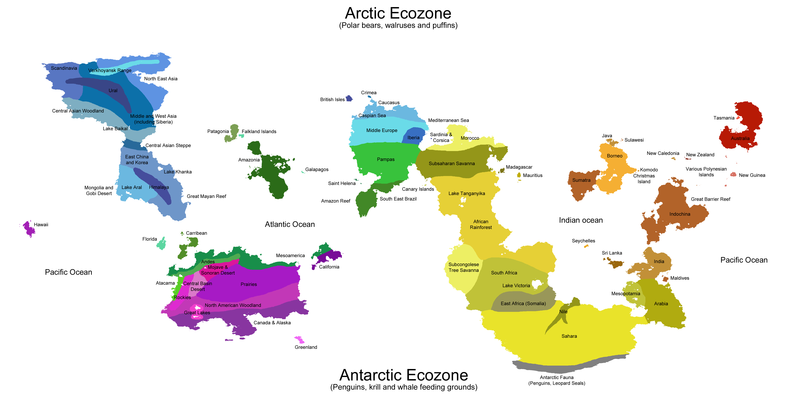 With that Ice Sheet in the south connecting the Canada/Alaska part to the Antarctica part thats going to have some very weird cross pollination of fauna. Such a Penguins with Polar Bears sort of deal. I wonder how the penguins will even survive being connected to the mainland and also ice sheet. Seems like predators could come at eat them on land or even raid their ground nests. Maybe, maybe not. It's also the south pole, so only a handful of creatures would be able to navigate the region. And those that could may not necessarily be suited for life on either of the two continents. I'm not sure it's an issue we necessarily need to worry about. This game is focused human development through time, and not a biosphere simulator. 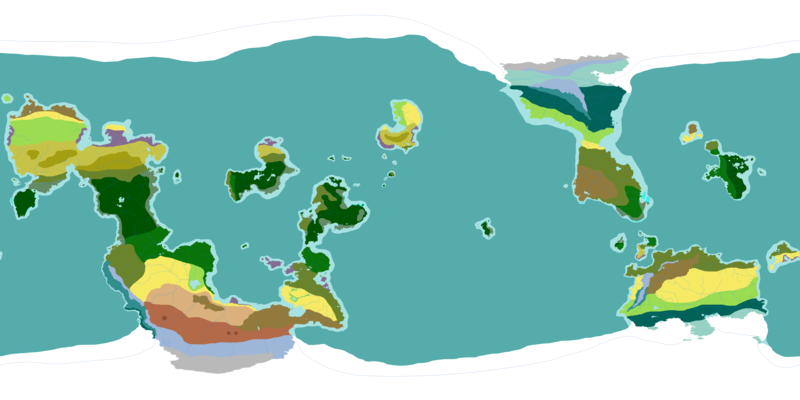 While it would be nice to have every organism in a balanced ecosystem like here on Earth, the fact that our lithosphere is so different makes that nigh impossible. If the only inconsistency is that we have a slight mix of arctic/antarctic organisms, I say we're doing pretty good. And like Pat said, polar regions don't have a lot of diversity anyway. the fact that our lithosphere is so different makes that nigh impossible. And that much more interesting! And just think! You know how people always incorrectly think that polar bears and penguins live together? Where on our world they'd actually be right! So.... Are we going to do anything with this? It's actually the same forum from the last PCP, so if you were a member of that one, you don't even need to make a new account! Page created in 0.145 seconds with 22 queries.